The 7-inch CAN Communicator Display allows full versatility in vehicle instrumentation, presenting data with an IPS color graphic display, receiving inputs from the vehicle, and displaying camera images. The display includes such unique features as the option for buttons, LED indications, and numerous analog inputs. The 7G can be used for in- or out-of-cab applications. The graphics display must be programmed, and VIS has the engineering resources for complex graphics design. It can do the software development in a partnership with a customer, either developing the software with customer input or helping the customer develop with the software with VIS expert support. VIS uses industry-standard design tools that are flexible and powerful to make sure customers have exactly what they want. 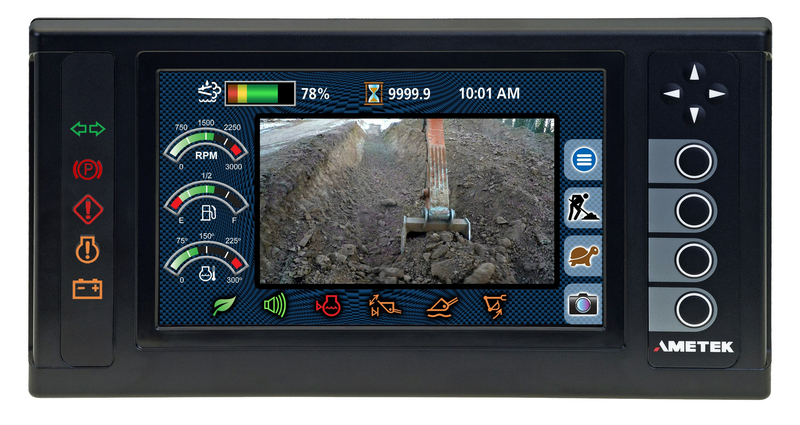 AMETEK VIS’ C-COM 7G display is part of the CAN Communicator family of rugged products that can satisfy the instrumentation requirements for all vehicle platforms. The optically bonded, high resolution display provides a rugged, easy to read interface with any vehicle or system. The 8 push button switches allow for easy navigation, with button prompts and navigation switches. The capacitive touchscreen is glove, water tolerant, and multi-touch capable. C-COM 7G features five dedicated LED icons for critical data, three of them dual color capable with red or amber. The real time clock has up to 11 days of backup timekeeping with no battery connection. Audio and video capabilities allow for support of in vehicle training videos, utilizing existing speakers in the vehicle cab. The high speed USB host output allows for phone battery charging with ample protection, and provides a host port for software upgrades, GPS, Wi-Fi, or Bluetooth. Software development is supported either through our Linux based board support package (with QT and VAPS as the recommended tools) or as a collaborative effort with our engineering team. C-COM 7G is sealed to IP67 specifications both front and rear. Designed to withstand harsh conditions typical of off-road environments, the display meets all SAE J1113 and J1455 requirements for vehicular instrumentation.